How can you survive a surgery that requires that your heart stop for a short period? Your tissues need oxygen; but the trick is to cool the body as much as possible to lower the need for oxygen. BioTime came up with a product called Hextend, which not only expands the blood supply, but also freezes at a much lower temperature - in fact, as low as 35 degrees Fahrenheit. Temperatures this low have never been tried with humans. BioTime has applied for a protocol for the use of HetaCool (TM), a reformulation of their Hextend blood volume replacement solution. If the protocol is approved, clinical trials will be conducted using it in low-temperature cardiovascular surgery. The protocol involves wrapping the patient in a cooling blanket and connected to a cardiopulmonary bypass circuit. His blood supply is completely replaced with HetaCool, and his body temperature is lowered to near freezing. 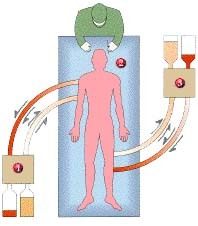 Following surgery, is original blood volume is replaced and the patient is warmed and revived. Science fiction authors have been writing about the possibilities of cold-sleep for generations (Robert Heinlein wrote about it in Methuselah's children in 1951). It has advantages not just for surgery, but for travel to the stars. Read more at BioTime, Inc. and Wired.